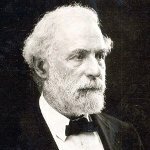 Robert E. Lee was born on January 19, 1807 to Henry Lee II, the ninth Governor of Virginia, and his second wife, Anne Hill Carter. He graduated from the United States Military Academy at West Point in 1829 and served as a military engineer for a number of years. Prior to the outbreak of the Civil War, Lee had participated in the Mexican—American War. After the beginning of the American Civil War, Lee resigned from the United States Army and was named one of the first five full generals of the Confederate States Army. He commanded the Army of Northern Virginia from 1862 until its surrender in 1865. Despite the defeat of the Confederates and his public opposition of racial equality, Lee is still regarded by many as one of America’s most distinguished military leaders of the 19th century. Robert E. Lee Day is mainly observed in southern states, such as Alabama and Mississippi, on the third Monday in January. In Florida, Lee’s actual birth date (January 19) is a legal holiday, but by and large it is not observed. Besides, it is overshadowed by Martin Luther King Day.